Bradenton Florida is located on US-41 between Tampa and Sarasota. It can also be entered from I-75 by exiting west on State Road 64. Shaw's Point near Bradenton was discovered in 1539 by Hernando De Soto on one of his voyages to the New World. The first town in the area was Manatee, incorporated in 1888. Bradentown was incorporated in 1903. It was named for Dr. Joseph Braden whose fortress-like house had been a refuge from settlers during Indian attacks. 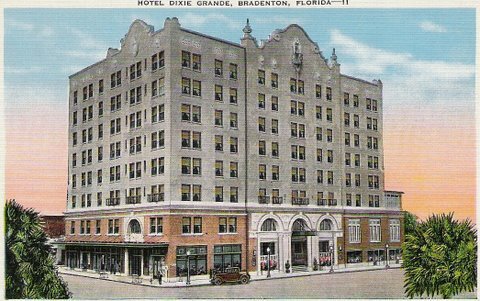 The modern city of Bradenton Florida was formed in 1943, when the town of Manatee merged with Bradentown. The name of the new town became Bradenton, along with its new spelling. Bradenton is surrounded by water, both fresh and salt. It is the access point for more than 20 miles of beautiful Florida beaches on the Gulf of Mexico and Tampa Bay. Bradenton is located on the mainland on the south bank of the Manatee River, and is separated from the outer barrier island beaches by the Intracoastal Waterway. These island beaches include Anna Maria Island and Longboat Key. Old downtown Bradenton is located on the west side of the city. Most of the office and government buildings in the county are located downtown. The tallest buildings in town are the 12 story Bradenton Financial Center and the new 9 story Manatee County Judicial Center. The new judicial center is right next to the historic courthouse. 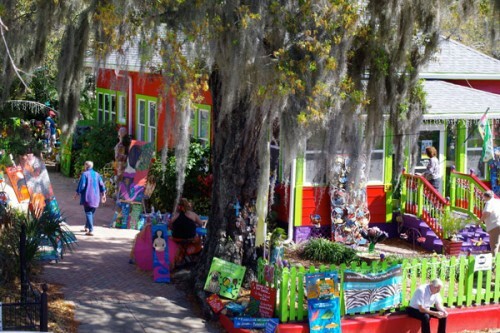 Bradenton's downtown area is delightful and loaded with museums, restaurants and shops. It is a compact area, and everything is within an easy walk. Just south of downtown is Bradenton's Village of the Arts. This is a neighborhood district with special zoning that allows residents to live and work in their homes. The creative zoning paid off. About 50 once rundown houses have been converted into studios, galleries, restaurants and other small businesses. The Village of The Arts has attracted national recognition because of its innovative approach. Bradenton was recently recognized as one of the Top 10 cities in the country for working artists. This award was made by Art Calendar, a well known business magazine for visual artists. Holiday Inn Express Bradenton West. This hotel is right downtown and is reasonably priced. 4450 47th St West, Bradenton, FL 34210. Tel: 941-795-4633. The Londoner Bed and Breakfast. Very neat, clean and cozy in the heart of downtown. 304 15th Street West, Bradenton, FL 34205. Tel: 941-748-5658. Pier 22 Restaurant. Indoor and outside dining on the waterfront. Good seafood and steaks, reasonably priced. 1200 1st Ave West, Bradenton, FL 34205. Tel: 941-748-8087. Manatee Players Riverfront Theater.. One of Florida's finest community theaters. The Manatee Players are an award winning troupe. 102 Old Main Street, Bradenton, FL 34205. Tel: 941-748-0111. ArtCenter Manatee.Located in the heart of downtown, ArtCenter Manatee is Manatee County’s premiere visual arts center. Nestled in the nearly 10,000 sq. ft. building are three galleries, five classrooms, an Artists’ Market gift shop and an art library featuring over 3,000 art volumes. 209 9th Street West, Bradenton, FL 34205. Tel: 941-746-2862. Cortez, Florida. 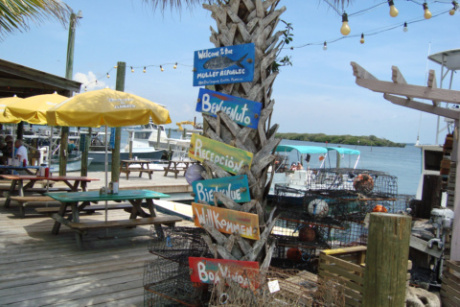 This is a little commercial fishing village located between Bradenton and Bradenton Beach. Nice little bars and restaurants with fresh seafood. Quaint and scenic little working town.